Good Human Resources (HR) are essential to running a sustainable organisation. We have pulled together some information that should provide you with a starting point for developing your approach to HR issues. 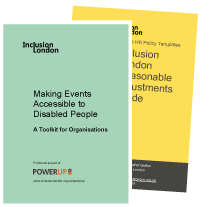 Type of support offered: HR Policy Templates developed to meet the specific Human Resources and employment needs of Deaf and Disabled People’s Organisations. Type of support offered: HR – Reasonable Adjustments. Offers financial support to employees for reasonable adjustments. Type of support offered: Leadership Development. Postgraduate training courses on leadership and specific areas such as fundraising, marketing etc. Short courses and masterclasses. Cost: See their website for details. Type of support offered: HR and Employment Law. Telephone advice, health checks, consultancy support, training, document bank each element charged at different rates (see menu). Type of support offered: HR. Leadership development. CEO support groups. Cost: Charities offered a discount of half the monthly fee. The full fee is £465/month.